Businesses run on data. The more value you can derive from the data within you organization, the more successful your organization will be. However, data analytics involves an ever-changing list of tools, and hard-to-find data science talent. RapidIT specializes in handling BI projects for its clients. From tool selection, to data transformation, and reporting – RapidIT handles data analytics projects end-to-end. Organizational data is really messy, unorganized data, confusing and complex. Our data experts help organizations understand it, not immediately usable without some degree of cleaning and prepping, so they can make informed business decisions and improve business performance. Our teams consist of expert business intelligence developers working alongside industry specialists. We work with the best tools in the industry – Hyperion, SQL Server BI, Informatica, Splunk, and Tableau. Whether you use one of these or a proprietary tool, we can adapt to them all. Analyze any data type including application logs, machine-generated IoT data, structured SQL databases, unstructure NoSQL databases – RapidIT can derive value for you from any data type or format. Our team of BI experts are at your service, so you can scale your data operations up or down without worrying about hiring any data scientists in-house. You’ll have all the expertise you need. 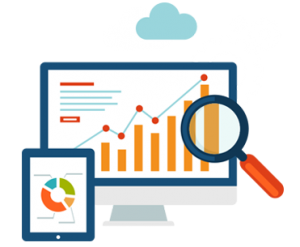 Our detailed and timely reports are customized to suit its intended audience. Whether it’s scheduled weekly reports or ad-hoc reports for an emergency, we’ve got you covered.